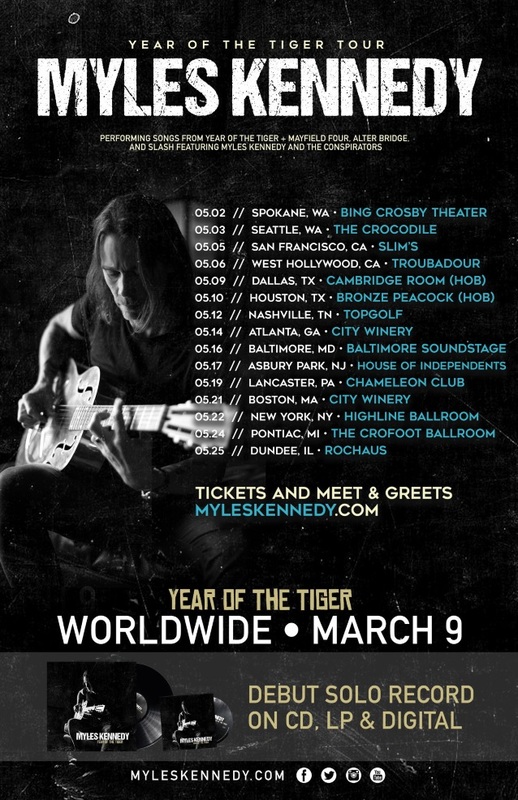 Myles Kennedy will embark on a U.S. tour in May. He will be promoting his debut solo album, “Year Of The Tiger”, which will be released on March 9 via Napalm Records. The effort was helmed by ALTER BRIDGE‘s longtime producer Michael “Elvis” Baskette. A special BLABBERMOUTH.NET presale will begin on Wednesday, February 7 at 10:00 a.m. EST and end on Thursday, February 8 at 10 p.m. local time. When prompted, type in the presale code “MYLESBBM” to access tickets before the general public. General admission tickets will be available for purchase starting Friday, February 9 at 10 a.m. local time. On “Year Of The Tiger”, Kennedy embarks on his first venture as a solo artist by embracing musical elements and influences he hasn’t explored until this point in his career. His appreciation for the blues and acoustic based music can be heard throughout the 12-song concept record inspired by the loss of his father when he was a child. “Year Of The Tiger” is a personal story framed in a new context from an artist willing to take chances. It’s also a story that took decades to summon up the courage to tell.